Virgin Voyages has unveiled itineraries for its first ship, Scarlett Lady, when it launches next year. It will sail four and five-night Caribbean cruises featuring an overnight stay in Havana, five-night Mayan Sol voyages to Costa Maya, Mexico, and five-night Dominican Daze voyages to Puerto Plata, Dominican Republic. Guests will be able to explore destinations with extended hours in port with an overnight or a late-night sail away on all voyages. Details have also been released about the ship’s standard cabins, 93% of which will have an ocean view and 86% a Sea Terrace. Cabins will be custom-created to accommodate the ‘Seabed’, specially engineered to convert from a bed into a lounger. 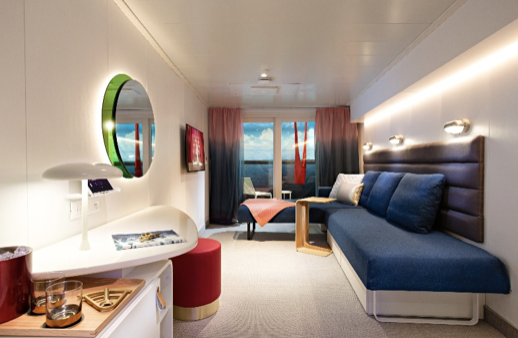 “We didn’t want to create the same old box of a bedroom that our Sailors would only use to lay their head down at night, we wanted to reshape the entire cabin experience,” said Dee Cooper, senior vice president of design. 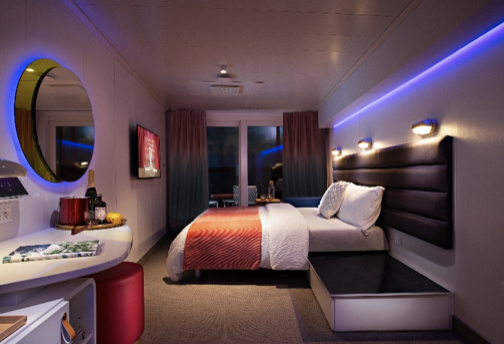 Most standard cabins will have in-room entertainment with 43″ flat-screen HDTVs, mini bars, ‘glam areas’ and flexible wardrobes. They will feature PIR presence sensors that automatically detect when guests have left the cabin and go into energy saver mode, where blinds will close and air conditioning will adjust to an eco-saver temperature. Virgin is committed to operate one of the cleanest fleets at sea.